Mahmoud Abbas is upset. “I don’t know why they are insisting on accusing the Palestinian people.” He's upset that the Arabs are being blamed for murdering the Fogel family in Itamar before the investigation is over. Gosh, I'd be upset too if I were unfairly being scapegoated. Except that when there's a history of murdering unarmed men, women and children it's not worth getting too upset. Looking back at 1964, the Palestinian Liberation Organization (PLO) was established by the peace-loving Yasser Arafat in order to liberate the "occupied" territories. Oops, there were no "occupied" territories until three years later when Israel won them in a defensive war. Oh well, never mind. While the PLO was fighting to librate land that was controlled by Jordan, they were very good at murdering Jews that were unable to defend themselves. Anybody remember the Munich Massacre, September 5, 1972, where eleven Israeli Olympic athletes were murdered by 'Palestinians'? Or the attack on the Achille Lauro in 1985, where the wheelchair bound, 69 year old Leon Klinghoffer was killed and his body thrown off the boat. I'm sure he was a real threat to the terrorists. Does anyone remember the Pesach seder bombing, or the Sbarro Pizzaria bombing, or the bus bombings? We could go on and on. But let's focus on the children. Abbas called the murder of the Fogel family, "inhuman and immoral". He is correct, but it's impossible to take him seriously. * June 11, 2000 - 5 month old Yehuda Shoham died after a rock attack on the family car. 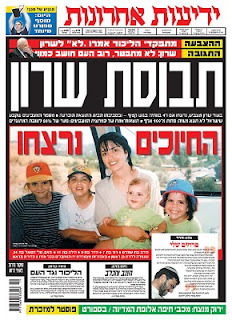 * March 26, 2001 - 10 month old Shalhevet Pass was deliberately shot in the head by a sniper. 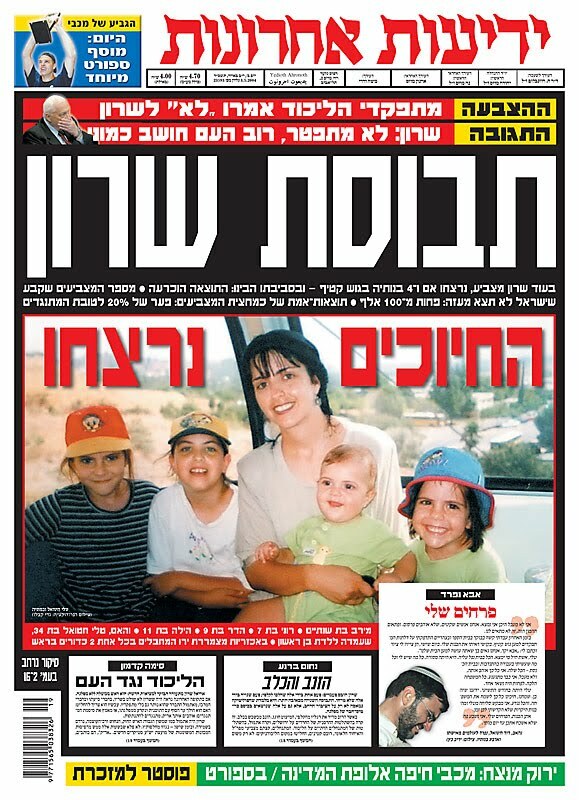 * May 7, 2001 - Kobi Mandel, 13, and Yosef Ishran, 14, were brutally murdered, their heads smashed with rocks at the entrance to a cave when on a hike. The number of children murdered can go on for pages, and it does. Please read through their biographies. But what struck me as similar was a story from 2004, when a pregnant woman and her four daughters were murdered at point blank range. No mercy was shown by the murderers for the Hatuel family. After riddling the car with gunfire on a road leading to Israel, the two terrorists then ran up to the vehicle and coldbloodedly pumped bullets into each of their victims' heads to make sure they had finished the job, Israeli police said. One of the gunmen also shot the swollen belly of the eight-months-pregnant mom at point-blank range. Yup, boy do I feel sorry for those 'Palestinians' who Abbas feels have been wrongly accused. Golly, I would have never thought to blame them for the knife attack on the Fogel family that murdered three children and their parents in their sleep - including a three year old and three month old. Wrongly accused? I doubt it. I think that since they handed out candy to children and celebrated these murders, as is their custom apparently, they have no right to complain about being accused prematurely.